We have a play-based curriculum that is supported by current brain research and is designed to offer children a rich variety of hands-on activities and experiences that are developmentally appropriate and engaging. The daily schedule is structured, yet flexible. The teachers seek to support, extend & enhance the children's thinking, interests and optimum development. Emphasis is placed on fostering self-esteem, self- expression, creativity and exploration. Teachers seek to educate the whole child. Our program includes lots of creative arts/ expression and opportunities to develop small & large motor skills, language / phonemic awareness (sounds of letters-words) and problem solving skills. Our teachers help children to learn social & communication skills (getting along with others, taking turns, using words to solve problems) Basic academic skills are taught with games, songs, reading, rhyming & fun activities. 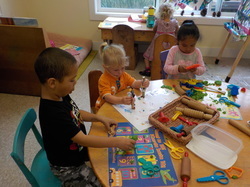 Our (private pay) preschool program runs from 8:30 am to 12:00 pm, and 12-3:30 PM, Monday through Friday, except holidays (we follow the Fort Bragg School District calendar).Students may also stay all day. The current rate is $25 per session or $45 for both. State Preschool sessions are from 9-12:00 and 12:30-3:30. There is no charge for this program but the family must meet financial eligibility requirements. CG is open to children (and families) of all races, religious and ethnic groups who are at least 2 3/4 years of age, toilet trained and are developmentally ready. State Preschool children must turn 3 or 4 before September 1 to be eligible. Contact us for more information, to schedule a visit, or to enroll your child. We look forward to hearing from you. If you would like to be added to our wait-list, please print out and complete the "application form" (under the "Forms" tab) and return it to the school by mail or in person.